The German language is a beautiful one to learn and master. Not everyone finds getting started with easy. But you will have to start somewhere. Learn German by Hello Hello is a cool application that helps expand your vocabulary and improves your reading, speaking, and writing skills. Hello Hello covers words you need to know to deal with real life situations in a German-speaking country. Hello Hello is designed for beginners. It covers over 1000 words and phrases. You get 30 conversational lessons to get a better understanding of the language. You can use flashcards to practice the words and phrases you are learning. 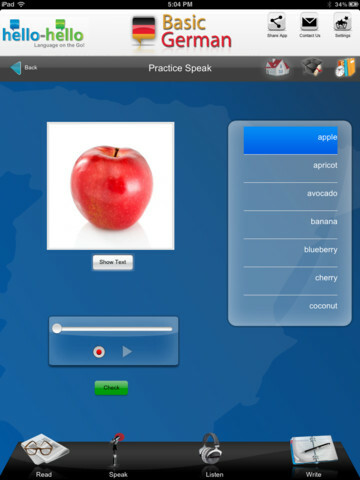 We love the fact that Hello Hello lets users practice reading and speaking. 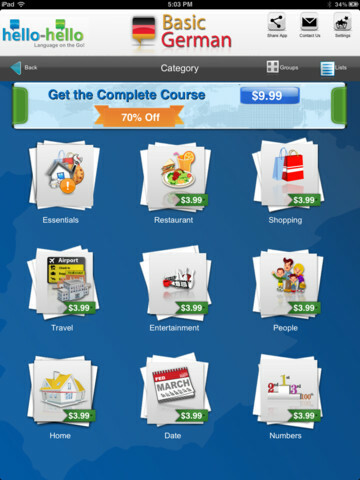 The app is free to get started with but you can buy more categories when you need. Learn German by Hello Hello won’t make you a guru in German but it does teach you enough to improve your skills and prepare you for foreign trips. The complete course costs you $9.99.